The winningest pitcher to ever come out of Maine did not, alas, reside in his native state for very long. “The Steamer” – Bob Stanley – was 2 years old when his family packed up and moved from East Kidder Street in Portland to Kearny, New Jersey, Stanley's mother’s hometown. And it's where job prospects appeared brighter for Stan­ley's father. Stanley, in later years, would label the move “break number one” in the series of events that landed him on the hill for the Boston Red Sox. As he stated in a 1977 Quincy (Massachusetts) Patriot-Ledger interview: “You can play more baseball in New Jersey than Maine, so I got more opportunity to develop.” Break number two was being left back a year in the second grade. As Bob related it: “By the time I got to high school, we had such a fine pitching staff that I couldn't break into it.” He had to play the infield and outfield for his first three years. In his senior year, however, things changed: “If I hadn’t been held back, 1 would have graduated with all those fine pitchers and wouldn’t have gotten the opportunity to pitch as a senior.” But he did get the opportunity, and he responded with a masterful 10-1 record. On the strength of his senior year’s performance at Kearny High School, Stanley was offered a contract by the Los Angeles Dodgers in the summer of 1973. But he was a ninth-round pick and the Dodgers’ offer fell short of what he had in mind. He turned it down. 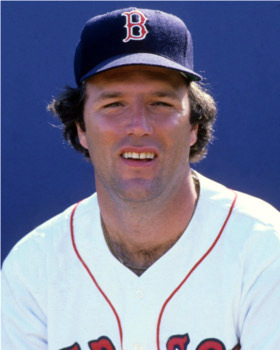 Six months later, in January of 1974, Stanley was the first-round pick of the Red Sox and this time he accepted the team’s offer. Stanley’s first assignment was with Elmira in the New York-Penn League in the summer of 1974. His record was hardly earth-shattering. He was 6-6 with a 4.60 ERA. The next season saw him with Winter Haven in the Florida State League. At first glance his record there appears a disaster: He lost 17 games while winning but five. But the won-lost mark is deceiving. Winter Haven hitters couldn’t hit. “I was 0-6 before that team even got a run for me,” Stanley recalled. His earned-run average was what did impress. It was 2.93 and it was obvious to anyone who actually saw him pitch that Stanley’s sinking fastball was a pitch to be reckoned with. It caused batters to hit the ball on the ground, easy pickings for a team with a good defensive infield. The next stop in Stanley’s professional career was Bristol, Connecticut, in the Double-A Eastern League in 1976. There he really strutted his stuff for the Bristol Red Sox: he was 15-9 in 27 games – all as a starter – and had a spiffy 2.66 ERA. Between Double-A and the majors there’s traditionally a year or so of seasoning at the Triple-A level. With the Red Sox that meant Pawtucket. Stanley, however, went directly to Boston. His work during the spring training of 1977 was so outstanding that Red Sox manager Don Zimmer decided to carry a 10-man pitching staff back to Fenway Park instead of his planned nine. Stanley was number 10. In his first year in a Red Sox uniform, Stanley set the pattern that would forever make him such an asset to the team. He was, as the Kansas City Star later crowned him, the league’s MVP – Most Versatile Pitcher. He was a starter. He was a long reliever. He was a short reliever. And he did it all well. His 1977 numbers include 13 starts, 28 relief appearances, and an 8-7 record, with a sub-4.00 ERA (3.99). His first game was in long relief, four innings on April 16 against the Indians in Cleveland, allowing just one earned run, earning him a save in the fifth game of the season, an 8-4 Boston win. It was in 1978 – the year of the ill-fated Bucky Dent playoff homer – that Bob Stanley really came into his own. Appear­ing in 52 games, all but three in relief, he posted a sterling 15-2 mark. He was second in the league in won-lost per­centage (his .882 was bettered only by Ron Guidry’s remarkable 25-3/.893) and tops in relief appearance wins (with an even dozen). Toss in 10 saves and just five home runs allowed in 141? innings and you have one mighty fine season. The next year, 1979, saw Stanley go almost full tilt. His relief appearances dropped to 10, but his starts numbered a career-high 30. He also won a career-high 16 games, four of them – just one behind league leaders Nolan Ryan, Mike Flanagan, and Dennis Leonard – coming via shutouts. He was selected for the American League All-Star team and hurled two innings of scoreless ball against the star-studded senior-circuit lineup, giving up one hit and one earned run. Stanley had identical 10-8 records the next two seasons, 1980 and 1981. They came via very different routes, though: In 1980 he split his time between starting assign­ments (17) and the bullpen (35 appear­ances), while in 1981 he was used almost exclusively in relief, making but one start. In 1982 Stanley enjoyed another banner season. He set an American League record for most innings pitched by a relief pitcher (168? ), notched a 12-7 record, and recorded 14 saves. In 1983 Stanley’s 33 saves ranked him behind only Dan Quisenberry of Kansas City (who had 45). It was a Red Sox single-season record until broken by Jeff Reardon in 1991. As Boston manager Ralph Houk noted in a USA Today interview: “I can’t recall ever managing anybody I could use either long or short as much as I use him.” Stanley was once more named to the American League All-Star squad. He did, though, post his first major-league losing season (8-10). More would follow. In fact, he would not see a winning season again until 1988. Fenway Park fans started to get on Stanley along the way. His spare tire made him an easy target. So did his $1 million salary. As he joked to his teammates at one point: “Maybe I should change to Lou Stanley.” That way, he reasoned, when the fans began to boo he could just say they were calling his name ... Lou. In 1986 Stanley enjoyed his first trip to the postseason. He struggled a bit in the American League Championship Series against the California Angels (4.76 ERA), but in 6? innings in the World Series while closing four of the games against the Mets, he didn’t allow a run – though it was his wild pitch in Game Six, in relief of Calvin Schiraldi, that allowed Kevin Mitchell to score from third base in the bottom of the 10th with the run that tied the score. Two more seasons of “understanding,” though, were enough. Stanley resumed relief work exclusively in 1988 and was 6-4 with a 3.19 ERA, helping the Red Sox reach the postseason, though he faltered against Oakland in the one inning he pitched, giving up one run. He never had a decision in postseason play, but an overall 2.77 earned-run average. In September of 1989 – after a number of run-ins with manager Joe Morgan – the Steamer packed it in, announcing his retirement. He was officially released by the team in late December. Stanley held the Red Sox record for most saves (132) until Jonathan Papelbon passed him in 2009. He compiled a 115-97 career record with a 3.64 ERA, including 21 complete games. As of 2014, he ranked eighth in career wins for the Red Sox. Stanley, his wife, Joan, and their three children had settled in Wenham, Massachusetts, about 25 miles northeast of Fenway Park. He owned a landscaping company. Bob began to play a little semipro ball. His fondest times, however, were very definitely family times. He was especially thankful for his son Kyle’s victory over cancer, and a goodly share of Bob’s time was spent participating in golf tournaments to bene­fit the Jimmy Fund, a charity supported by the Red Sox that raises money to fight cancer in children. On April 4, 2011, Stanley was named president of the Seacoast Mavericks, a New Hampshire-based team in the Futures Collegiate Baseball League. In 2012 he was serving in the Pacific Coast League as pitching coach for the Las Vegas 51s, the Triple-A affiliate of the Toronto Blue Jays. When the Blue Jays switched their Triple-A affiliation to the Buffalo Bisons in 2013, Stanley continued as pitching coach. In 2014 he was the Blue Jays’ bullpen coach, but was not brought back for the 2015 season. The man who went from Portland to Boston – via Kearny, New Jersey – may be forever remembered as the pitcher who allowed the run that tied the sixth game of the 1986 World Series. He might better be remembered as the man who pitched in more Red Sox games – 637 – than any other player in the club’s century-plus history. That’s something really worth remem­bering! This biography originally appeared in Will Anderson’s book "Was Baseball Really Invented in Maine?" (Portland, Maine: Will Anderson, Publisher, 1991) and appears here with permission. This version has been slightly modified, and was updated by Bill Nowlin in May 2012 and by Len Levin in 2014. It also was published in "The 1986 Boston Red Sox: There Was More Than Game Six" (SABR, 2016), edited by Bill Nowlin and Leslie Heaphy.